Published in The Market magazine, 2012. Original article. The electric car is stepping out of its niche as a green product, as numerous new launches from mainstream manufacturers is making the eco choice look increasingly attractive. We take a look at the challenges for the next generation car. If we want to keep driving we have to get creative, as fossil fuels will not last all that much longer. Running a car from the electric socket is emerging as the next step in automobile evolution, as eco cars are breaking out of the tree-hugger niche and into the mainstream. “Global trends are changing the automotive environment and causing structural shifts,” says Claire Tracey, manager of Smart operations at Mercedes-Benz UK. The electric mini-car from Smart, which operates under the Mercedes-Benz division of Daimler, is a familiar face on the eco car scene. Until now this arena has been dominated by environmentally conscious drivers keen to reduce their carbon footprint, but, says Tracey, the growing market means an increasingly diverse groups of drivers are starting to think electric. Vauxhall, Renault and Peugeot are just a few of the manufacturers now launching zero-emissions electric cars, most of which can run 100 miles on a single charge. But while choice and range is improving, we are a long way away from electric cars becoming the default choice. Driving 100 miles for £1.25 in electricity is remarkable, but the upfront cost is significant and the battery only lasts about six years. In order to help with this, the UK Government will chip in a good chunk of money to help those keen to make the change, and the number of public charging points is expanding to ease the transition to the plug-in habit. Ahead of the launch the 3rd generation Fortwo car this summer, Smart takes a similar big picture view: “Shrinking oil reserves, rising energy prices, a growing urban population, and intense demand for mobility are all factors now driving the transformation of the automotive industry,” says Tracey. “It is still very, very, very early days for the electric vehicle industry as being something that could replace a regular car,” says Gian Avignone, country manager for the UK and Ireland at Tesla Motors. Established in Silicon Valley in 2003, Tesla’s stated goal is to “prove that electric vehicles can be awesome”, and the company certainly managed to turn a few heads with the launch of the Roadster, its zero-emissions luxury sports car. Most of Tesla’s customers are what Avignone describes as sustainability-conscious but unwilling to compromise on style: “Buying an electric car is both a rational and an emotional decision.” The Tesla Model S, a luxury saloon car, will launch this year, followed later by the Model X, a SUV. Unlike the Roadster, the Model S will be applicable for the UK government grant. The expansion of the eco car market will see people attracted to electric cars for a variety of reasons, following early adopters who, says Nissan’s Kouyiounta, “are mostly relatively well-off, technologically savvy individuals with a strong sense of social duty”. He expects the financial benefits to become more of a motivator for buyers, however the high upfront cost means people will still need to be driven at least partially by environmental concerns. Buyers of ultra-low emission cars can get up £5,000 off the sales price through the Department for Transport’s (DfT) Plug-In Car Grant. The funding, guaranteed until 2015, applies to cars with emissions of no more than 75g of CO2/km. 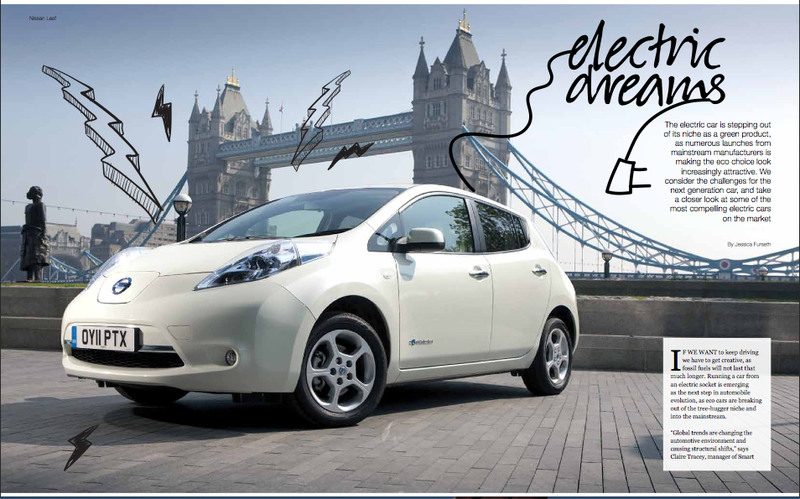 A total of 2,610 electric cars were licensed in Great Britain by the end of 2011, 1,204 of which were registered for the first time last year. The Government has set aside £80 million to support research and development, with £30 million allotted for charging points in public places such as shopping centres and car parks. Over 2500 charge points are now in place, 765 courtesy of the DfT, with 4000 more committed by the private sector to be installed by the end of this year. As electric cars now typically run 100 miles between charges, the power problem is put into perspective by considering 70% of drivers travel less than 50 miles per day. PSA Peugeot Citroën, on the market with the Citroën C-Zero and the Peugeot iOn, believes electric and hybrid vehicles could make up 15% of the market by 2020. Consequently, over the next few decades we will likely see a mixture of technologies, with electric cars existing alongside petrol cars, synthetic fuels and vehicles running on alternative technologies such as hydrogen-powered fuel cells. As the Government subsidises the rollout of low-emission vehicles in the name of battling climate change, there is also a compelling argument for supporting UK manufacturers to ensure they can claim their share as the next generation automotive industry is taking shape. Posted on 05/02/2012 by Jess. This entry was posted in Climate change and cleantech, Lifestyle features, Technology features. Bookmark the permalink.